The GoPro Fetch harness is adjustable to fit dogs of all sizes, and it is padded for your dog's comfort. 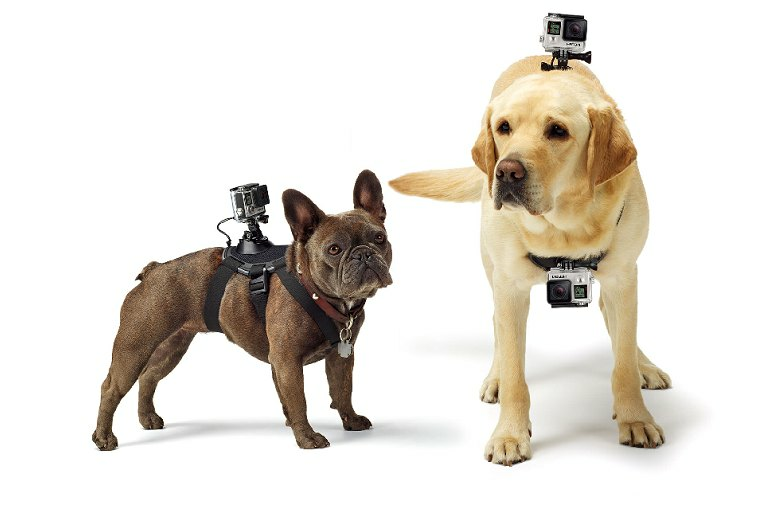 The Fetch can be mounted on the dog's chest or back, allowing you to capture video from different points of view. It's water friendly and washable, so it can be worn by your dog while swimming and playing in the mud. Some dogs may not find the Fetch comfortable. The harness may not stay attached to dogs that run fast or jump. It does not include a GoPro camera; you must supply your own. Ever wonder what the world looks like from your dog’s point of view? Wonder no longer. 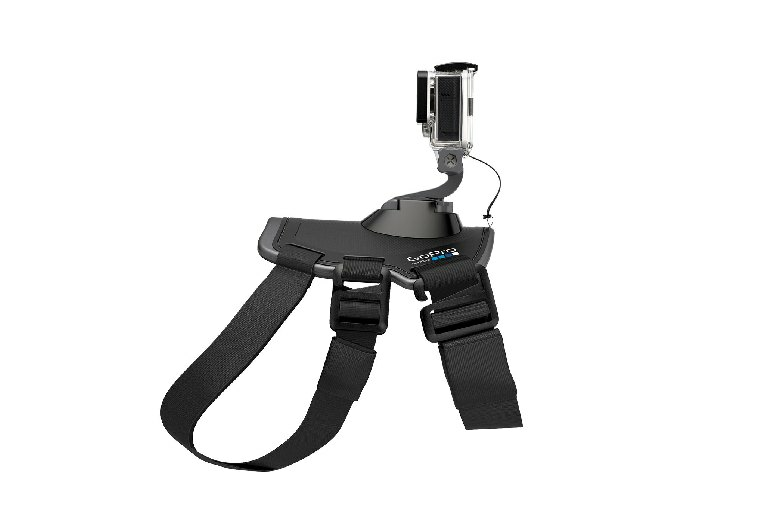 The GoPro Fetch harness allows you to attach your GoPro camera to your dog’s back or chest. It’s adjustable to fit dogs between 15 and 120 pounds, and it can be worn in dirt, mud and water. It’s washable and padded for your dog’s comfort. 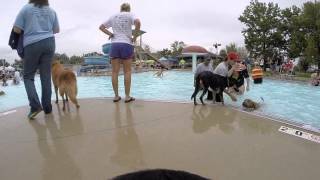 The Fetch does not include a GoPro camera; that must be purchased separately. You can get creative with the settings on your GoPro and angle the attachments anyway you want. With the wide angle of the GoPro, I found I didn’t need to do too much adjusting to get some awesome shots from the dogs. At first I thought this was going to be a nightmare to put on, but I was able to do it in under 2 minutes the very first time. All in all it’s a fun little piece of equipment and you can definitely get some cool shots using it, but it really does shake too much to use it for more than a short cutaways. The Fetch’s adjustability means that it worked with a range of different dogs I know, from very small to very large, and the two mount locations provided an interesting shift in perspective (although the back mount in general produced much better footage). 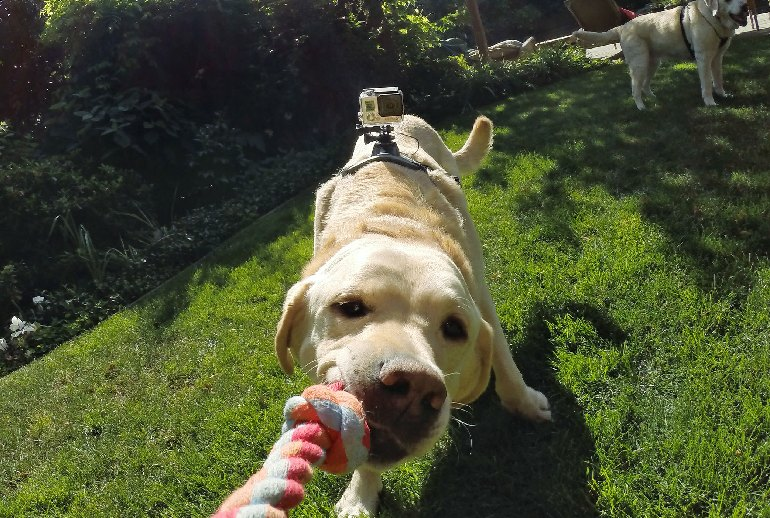 At $60, Fetch is one of the pricier accessories available from GoPro, but with its two-mount setup and durable construction, it’s certainly an item worth wagging your tail over. And everything's washable and water-friendly, so you can even record your dog's swimming excursions — if that's something you want to do. 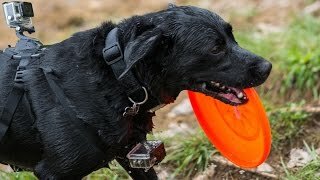 In case your dog gets a little wild, the cameras attached to the ‘Fetch’ can be secured by an additional camera tether so they don’t get lost should they come off of the mount. 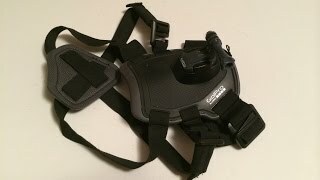 We put this harness through its paces. It went where our dogs went, and we took it out in all sorts of conditions. After a few weeks of testing it, the harness was filthy. But the good news is, the GoPro Fetch harness is machine washable. After the initial trial walk with the harness and camera, she was comfortable wearing it and acted normally each time. Video taken from a dog calmly walking down a street will be relatively smooth and controlled. However you may feel mild nausea after watching footage of a hyperactive dog tearing around a field, rolling in the first muddy puddle he comes across before shaking himself dry.